Retrofret Guitars has posted for sale a rare 'Soloist Custom' theremin built by Leon Theremin himself. The price? It's a bargain if you have a spare $75,000 to spend! The sale is listed on Reverb.com. It was originally listed in 2013 (see our earlier article) and appears to either not have been sold since or is back on the block. Leon Theremin "Soloist Custom" Model Theremin, c. 1938, made in New York City, dark brown varnish finish, walnut cabinet containing fixed stamped steel chasis. This is one of the few instruments that Leon Theremin personally built in his New York workshop (as opposed to the RCA instruments made under license). It had been discovered in the basement of a private home in Sheepshead Bay Brooklyn in NYC. Theremin himself hand built very few instruments - perhaps ten prototypes and soloist instruments of the electromagnetic variety between 1928 - 1938. Unfortunately there are no hard facts as to how this particular Theremin came to be hidden away in a Brooklyn basement. Coincidentally, Theremin's 2nd wife Lavinia Williams did live in Sheepshead Bay until 1953.The instrument itself is quite unique to Theremin's work. Lev made a handful of soloist instrument most notably for Clara Rockmore and Lucie Rosen. This is one of only two instruments that he made with the speaker section built-in to the lower section of the podium (all others, including those by RCA, having separate speaker cabinets). One was made for a soloist named Juliet Shaw and at this time, still privately owned - the other is depicted in a news clipping from Tennessee c. 1940 being played by Evan McKinley of 'The Musical Messengers' (also noted for performing on the "largest set of piccolo bells and musical glasses in America." I believe that this is the same instrument as in the news photo (see attached).Unlike most surviving instruments (both RCA and Lev made) nothing had ever been done to alter or customize the original design and construction. Even the original antennae survived! We've spent over two years painstakingly rebuilding the instrument using NOS tubes and parts. It now works flawlessly - as it did when it left Mr. Theremin's shop in 1938.This instrument utilizes both voltage regulation and a rotary tone color selector. 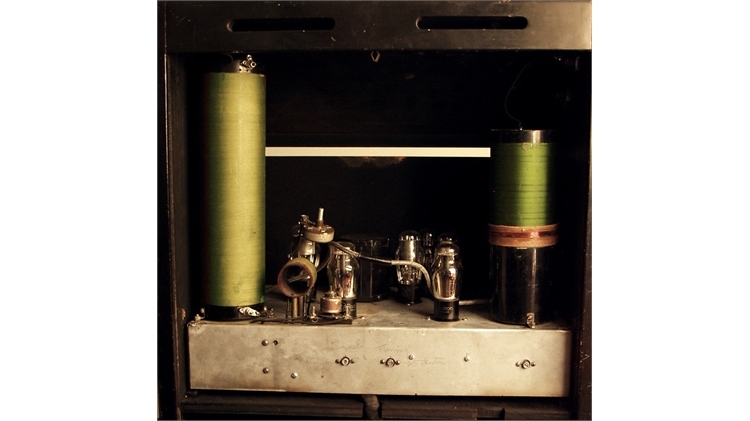 Tone color switches were a feature of Lev's own personal demonstration instruments in the 1927-28 era, but are not generally seen on Theremins built for others, until appearing on this unit. The oscillator and resonance coils employ the green silk-insulated windings a feature employed only on Theremins made by Leon himself. "Bathtub style" capacitors are used in portions of the construction, as seen in other Lev-built Theremins, although this instrument utilizes fixed-value oscillator capacitors in lieu of Lev's usual stacked mica capacitors.This is the only currently known surviving instrument that employs both an inductively-heated volume control tube, (in this case a UX-120 and generally typical only on his earlier designs), and the "Type 53" dual triode tube (employed in Lev's later custom instruments for Clara Rockmore and Lucie Rosen). Lev's hand-written numbers appear on the chassis top.This is probably the very last instrument Lev Theremin made himself before leaving the USA.Height is 44 in. (111.8 cm. ), 20 in. (50.8 cm.) across at the widest point, and 12 3/4 in. (32.4 cm.) deep. Minor bumping and scratching to the cabinet. Original finish with the exception of one section of replaced decorative molding. Several replaced wax capacitors with the newer ceramic components being fit inside the original paper sleeves to preserve the look of the 75 year old components. Fully restored and operational. Excellent Condition.